This issue featuring a look at The Mark On The Door, a somewhat different look at The Secret Warning, new collectible discoveries, letters and more! Be sure to bookmark the new locations. Any Nancy Drew fan could tell you that The Secret Of The Old Clock was the first title in the Nancy Drew series but did you know that it almost became a Hardy Boys story? 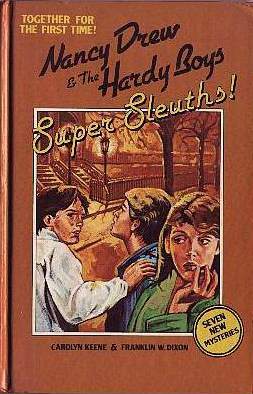 See Hardy Boys Titles That Never Were! On the FOX show "Futurama", a character is seen going through a pile of books muttering "Hardy Boys - too easy, Nancy Drew - too hard." The creator of the show, Matt Groening, is also responsible for the hit FOX show, "The Simpsons", a show which has mentioned both the Hardy Boys and Nancy Drew several times. It seems a likely bet that Mr. Groening was (or maybe still is) a fan of the Boys. If you're not already a member, you're missing out on the latest Hardy Boys news! It's also a great place to buy/sell/trade your Hardy Boys items or just talk about the Boys with the over 300 other members who have joined since 1999! Note the cast - It looks like a who's who of washed up teen idols! 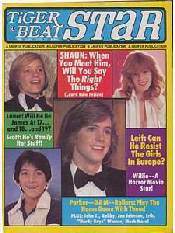 A couple of teen magazines from the 70's with articles about Shawn Cassidy & Parker Stevenson. May be British or a library rebind. # 13 in the series. The Plot: "The motorboat was just speeding back down the bay when the storm broke. There was a howling gust of wind, a few slashing streaks of rain, a flash of lightning, a roll of thunder. Then the skies seemed to open. The rain fell in a torrential downpour. Bayport was completely obscured from view ." This is how Leslie McFarlane launches the story; with Frank and Joe caught out at sea during a sudden Bayport squall in their sleek motorboat, the Sleuth. Now if this is not a classic, quintessential Hardy Boys opener I don't know what is; the boys caught out in the notoriously tempestuous weather of Barmet Bay! This is not how I expected The Mark On The Door to begin, given the dry desert scene on the cover. I was not to be deceived, though, because although the story does begin in Bayport it does not stay there for more than three chapters or so. While on their return to safe harbor the boys are dangerously clipped by a mysterious powerboat. The boys get a glimpse of a dark stranger at the wheel of the craft who the Hardys quickly deduce as being a "foreigner". Of course this is no random incident as we are too soon find out this is the Mexican Pedro Vincenzo who is to be the Hardys main foe throughout the story. Upon the miffed Hardys return to their private boathouse they are greeted by their friend Chet. He urges them to go immediately to the courthouse to view the proceedings of the sensational Rio Oil Company fraud case which apparently has the whole town of Bayport up in arms. The case involves the sale of phony Mexican oil stock that has duped many local residents out of their money. In a dramatic court room scene the District Attorney excuses himself to take a message which reveals that the State's principal witness, the bookkeeper of the Rio Oil Company Elmer Tremmer, has mysteriously disappeared! While watching the trial Frank and Joe notice the dark stranger who damaged their boat sitting in the courtroom. Unfortunately for the Hardys he spots them and successfully escapes out the back of the building. As luck would inevitably have it, the boys are able to pick up the scent of their antagonist soon afterwards when Aunt Gertrude is attacked by a Mexican hairless dog. The dog was apparently given to the local boarding house owner, Mrs. Smith, by a mysterious man from Mexico. The opportunistic Hardys immediately question the landlady and come to find out that the name of the Mexican is Pedro Vincenzo. They are astonished to hear that he just checked out in a hurry ten minutes ago! While searching his room, Joe discovers a mysterious symbol engraved on the door; apparently carved by Vincenzo. They are able to conclusively link him to the oil stock case when they find out that he passed off the worthless stock certificates to Mrs. Smith as rent payment. After the trial is suspended, the services of Fenton Hardy are retained by the D.A. to track down the missing bookkeeper, Tremmer. Some clever detective work by the boys at the local airport proves that Vincenzo purchased an airline ticket for Tremmer to fly down to Brownsville, Texas near the Mexican border. Both of these events lead to Fenton and the boys flying down to Texas to hopefully locate and then return the prosecution's key witness. The apprehensive Fenton is acutely aware, however, that the three of them might have to cross the border, as it is likely that Tremmer would not have stayed in Texas. Upon their arrival in Brownsville they do indeed find that Tremmer is gone and likely in Mexico. They also find and soon befriend a stowaway Mexican boy, Juan Marcheta, who had been kidnapped from his homeland by confederates of Vincenzo. Frank and Joe's enthusiasm and stellar detective work finally persuades their father to let them fly down to Mexico with him in pursuit of Tremmer. Juan invites them to stay at the home of his parents, which coincidentally turns out to be a luxurious hacienda in the region of Mexico where they believe the missing witness might be captive or in hiding. Here at the home of Señor Marcheta (Juan's father) Fenton announces that he is leaving the boys there for several days in order to search for clues elsewhere. This is the point in the story when the real Mexican adventure begins in earnest for Frank and Joe. Their plan is to investigate the alleged location of the phony Rio Oil Company, supposedly located miles away near a secluded desert oasis. But before they leave, they discover the same strange mark that Joe discovered back in Bayport on the servants quarter's door.Frank decides to stakeout the area that night only to find Vincenzo attempting to enter the door. A struggle between the two ensues with Frank almost predictably being conked over the head by a henchman of Vincenzo. Their cross-country adventure finally begins when Frank, Joe, Juan, and Señor Marcheta venture out on horseback to hopefully find clues at the alleged Rio oil well sites, and most ambitiously, find the missing key witness Tremmer. After Señor Marcheta's horse breaks its leg, they are fortuitously met by a travelling Yaqui Indian who also happens to be a good acquaintance of Señor Marcheta. Frank volunteers to go into town with the Yaqui Indian to purchase a new horse, while Joe, Juan and Señor Marcheta continue the journey. The three eventually come upon an encampment. Under the cover of darkness, they eavesdrop on what appear to be a group of gypsy-like natives who are apparently in league with Vincenzo. Joe discovers that there is some unrest concerning whether they will be paid. Joe also catches a glimpse of an American who he thinks might be Tremmer. The next day the three meet up again with Frank and the Yaqui, incidentally named Yaqui; who have returned with a fresh horse. But, they also arrive with the news that Señor Marcheta and his son must return home immediately to attend to pressing business. This leaves only Frank and Joe with Yaqui as their loyal and competent guide. They immediately commence their pursuit of the caravan up into the hill country over the next few days, about a half-day behind the caravan. While they are winding up a mountain trail the group is unfortunately taken captive by part of Pedro Vincenzo's gang. Yaqui and the boys are forced into an arduous march deeper into the mountains where the natives commanded by Vincenzo are camped. Here they finally come face to face with their cruel antagonist who orders them to be held captive in one of the numerous mountain caves. For the next couple of chapters Frank and Joe seem to escape and get recaptured several times in the camp all the while gathering clues to the mystery and formulating escape plans. They even finally find Elmer Tremmer, who, much to the chagrined boy's surprise, is revealed to be a paranoid coward who mistakenly believes that his only way out of being arrested back home is to stay with Vincenzo in Mexico. He even refuses to help the Hardys escape! Their hopes are resurrected, however, when the camp is thrown into chaos as an apparent revolt erupts among the natives. With the aid of Yaqui they learn that many of the natives have joined forces with Tremmer of all people in a mutiny against Vincenzo. A grand, yet bloodless fight, breaks out between Tremmer's supporters and the few remaining Vincenzo loyalists. As the fight draws to a climax, Tremmer offers a deal with Vincenzo to exchange his freedom in return for the delivery of Fenton Hardy! The boys are horrified to hear that Tremmer might have a bead on their father. As a counter move the strategic thinking Frank instructs Yaqui to follow Tremmer and blaze a trail for the Hardys to follow later. Unfortunately, the two brothers are promptly recaptured by the triumphant Vincenzo, who threatens them for the second time that he is going to brand his "mark" on their foreheads. They soon find out that this is no empty threat. After a charming scene in which Joe affectionately coaxes a stray Mexican hairless puppy into their cave to keep as a pet, the boy is later forced to bargain for possession of the animal with a pretty young native girl who, chillingly, has Vincenzo's mark branded on her forehead! Frank and Joe are downcast as they realize that Vincenzo is a cruel man who would brand people who dare cross him. Their spirits and hopes are completely deflated when Tremmer actually shows up with Fenton Hardy, who is promptly thrown in their cave-prison with them. Fenton and the boys are kept without food for days in their guarded cave with only Joe's puppy to keep up their spirits. Fortunately, their predicament changes when the guard finally offers them some food and water. Based on a prior tip from Yaqui, Frank instructs his dad and brother to avoid drinking the water, and then craftily tricks the guard into drinking it. The water turns out to be drugged and the Hardys are left free to escape! Frank ventures out first and returns a short time later with their outfitted ponies. The three of them then escape from the camp and soon pick up Yaqui's blazed trail which eventually leads them to outside Tremmer's tent. Here they find the loyal Yaqui waiting for them. They quickly apprehend Tremmer and then all head out together to the Marcheta hacienda based on Tremmer's revelation that Vincenzo is conspiring to kidnap Juan's sister Dolores. Once they appraise Señor Marcheta of the situation he recruits a group of soldiers to go back to the camp and capture Vincenzo. When they arrive at the camp they find it has been deserted and that Vincenzo has disappeared. Not to despair, because Joe reminds Frank and his dad of the tree trunk that they saw earlier with Vincenzo's mark on it. On a hunch, he leads the posse to the tree to discover that the symbol is a mark to a door concealed in the tree. It opens to a stairway which descends down to the secret lair of Pedro Vincenzo. The villain is captured and eventually prosecuted back in Bayport. The Hardys are victorious! They return to Bayport where Joe presents the landlady Mrs. Smith with the puppy (named "Egg" by Joe, great Hardy trivia!) to replace her Mexican hairless dog that had died mysteriously earlier in the book. Fenton Hardy is given a hefty reward for solving the case which he fortunately shares with the boys. Everybody is satisfied. Not the least of which are the Bayport investors who have all of their money returned to them by Frank and Joe, who had found the cache of swindled cash earlier in a marked cave in the cliffs (the scene depicted in Gillies cover art) back in Mexico. Comments: The original The Mark On The Door is an absolute delight to read! I found myself completely absorbed by this book. I even chuckled out-loud at some of the subtly humorous scenes. This is clearly a Leslie McFarlane authored book; full of humor, detail, and finesse. It is beautifully paced giving the reader the chance to experience some of the emotions and feelings of the boys as they undertake what turns out to be their first long-distance plane flight and international case. You can feel the boy's excitement and sense of wonder as they prepare for their first trip outside the USA. The Mexican desert is far from the typical Hardy Boys plot setting but it seemed to serve as a grander and more majestic backdrop to the plot than what we are normally accustomed to. The Mark On The Door is a relatively linear story by Hardy Boys standards. Nowhere do we have the annoying hairpin plot turns that so many of the later books have. The Mark On The Door would actually make a great Hardy Boys movie; and I wouldn't say that for a majority of the books. It is exciting, believable, and has an excellent and memorable cast of supporting characters. The hospitable Señor Marcheta is wonderful as the gracious host who serves as sort of an elder father figure to the boys. Yaqui the Indian is a vivid character who we get to know as not only an expert outdoorsman but as a loyal companion of the highest integrity and wise disposition. His stoic Zen-like demeanor under the face of adversity has a very calming influence on the boys who get depressed and downright fatalistic at times. The evil Pedro Vincenzo is one of the best-developed villains of the series. His key involvement in the Rio Oil Company fraud in the States demonstrates his cunning sophistication. His unwelcome desire of and quest for Señor Marcheta's daughter shows his more human nature. And his evil threats and treatment of the boys in the mountains betrays his callous cruelty and greed. Even the spineless and weasel-like Tremmer is a very memorable character. While technically not a villain like Vincenzo, he is just as despicable. What I like the most about this story is the way 16-year-old Joe and 17-year-old Frank come across as more human; more like you and me. The Hardy Boys actually seem to be boys! They are not portrayed as bulletproof in this story. On one depressing occasion they desperately resort to shamelessly begging their captors for food. Later they are reduced to wolfishly devouring some "still flopping around" trout that they are able to steal from some unsuspecting native fisherman. And most un-Hardy-like, they at one point even bemoan the fact that they ever decided to become detectives in the first place! Although they suffer greatly at times and have serious doubts about how they will survive their ordeal, they do end up exhibiting plenty of gumption and Hardy ingenuity in overcoming their obstacles and bringing the case to a successful conclusion. Another plus is the fact that the boys don't bring along any of their usual sidekicks. McFarlane evidently doesn't feel the need to use Chet as a strawman to demonstrate how much braver, smarter, and thinner the Hardys are. 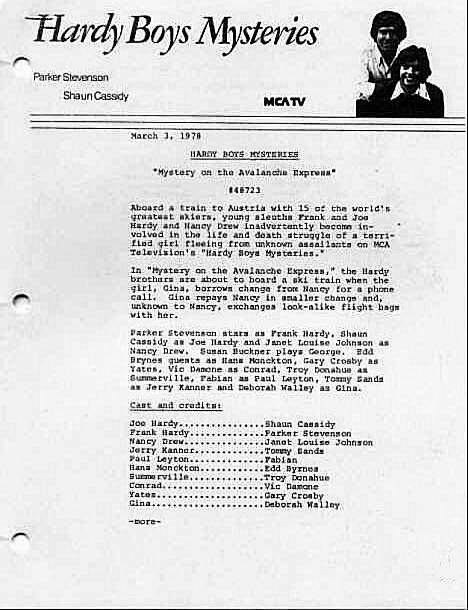 Except for the very beginning when they are still in Bayport, we are treated to experiencing the adventures with Frank and Joe only for a change. Incidentally, the Chet that we do meet early in the book has a lot more "spit and vinegar" in him then the hapless fat chum of later books. His friendly taunting of the two brothers seems to come from a boy who fancies himself on more equal footing to his "famous" friends. Similarly, Aunt Gertrude not only has more bite in this story, but she is presented as more of a force to be reckoned with rather than merely an amusing old woman to be dismissed. As usual, the irrepressibly cheerful and supportive Laura Hardy is virtually invisible. I did notice that Fenton Hardy shows more fatherly concern over his boy's safety and their lack of experience in this book. Rather than treating them as full-fledged adult partners, you get the feeling that he is aware of and is concerned that his sons are still only boys participating in very dangerous adult situations. Lastly, I want to comment on the controversial aspect of this book. Some commentators have categorized The Mark On The Door as a member of the infamous "racist trilogy": #12 Footprints Under the Window, #13 The Mark On The Door, and #14 The Hidden Harbor Mystery. I think that this is unfortunate and inaccurate. There certainly are no outright racial slurs or overt put-downs in the book. On a couple of occasions the author does employ the use of dialect in the dialogue to paint a more vivid and realistic picture of a character. For example, the chief bandit who initially captures the trio of Yaqui and the boys menacingly threatens "Do you weesh me to use thees knife?" But really, this is by far the exception as most of the characters such as Señor and Juan Marcheta, Yaqui, Pedro Vincenzo, and all of the Indian henchman don't even speak with an accent at all. Actually, the dialogue of the Scottish powerboat owner, Sandy MacPherson, in the beginning of the book is probably the most stereotypical and unintelligible. As far as McFarlane's overall portrayal of Mexico and the Mexican people is concerned it was for the most part highly flattering. He in fact portrays a rather Pollyannaish view of Mexico. If you were to read this book at face value, you might infer that most people in Mexico live in plush haciendas or make a living off the land in relative ease and harmony. I received the impression that the author appreciated the country and the people. I'd rate the original as an "A" because I believe that it ranks as an early Hardy Boys classic; the kind of book that built the popularity of the series in the first place. I'd also add a minus, because the plot does take place outside of the classic Hardy Boys setting of Bayport and the northeast coast region in general. This, unfortunately, might be a turnoff for some fans. The Applewood Books edition of the original text version of The Mark On The Door is available from Amazon.com as is the revised text edition by Grosset & Dunlap. Hardy Boys #17, (A.K.A. The Secret Warning) was first published in 1938, and was the first of five Hardys novels to be ghostwritten by Dr. John Button (okay, let's hold down the booing!). The good doctor had taken over the reigns from the legendary Leslie McFarlane, who had written the previous sixteen volumes, and is generally regarded as the best of the "Franklin W. Dixons." While not as flawed as some of Dr. Button's later attempts, (including The Mystery of the Flying Express, and, of course, The Disappearing Floor), The Secret Warning had its share of peculiar literary decisions, which I've chosen to exaggerate here, possibly to humorous effect. I hope you enjoy it. "It's a mystery to me," said Joe Hardy as he worked over the engine of the Sleuth, "what it is that puts the motor out of order all the time." "It certainly is a puzzler," agreed Frank Hardy, Joe's dark-haired older brother. "Perhaps we should stop just tapping on it, and try a different approach to repairing it." "You fellows should leave it broken if you ask me," drawled their chum Chet Morton, his gelatin-like mass conforming to the bulkhead behind him. "Why tempt Mother Nature?" "Think about it," Chet continued, "as soon as this tub is fixed, you'll want to take it out on the bay again. Then, as always, a sudden storm will come up, and then, as always, I'll be knocked out of the boat, into the freezing water. Who needs it, I say!" "Don't worry, Chet," taunted Joe. "The only way you could sink would be if someone harpoons you!" "Say, fellows! That's Mr. Perry, the deep-sea diver! Did you know he wears thirty-two pound shoes?" "No," drawled Chet. "Did you know my uncle wears women's underwear?" Realizing how valuable the skills of a deep-sea diver would be to repairing the Sleuth's motor, Frank called Mr. Perry over to the boat, and explained their dilemma. "Have you tried tapping on it?" suggested the lanky diver. Soon, with four heads proving marginally better than three, the Sleuth's motor was purring like a kitten. With Chet at the controls, the stout lad began to move the boat a foot or two. "You'll pay for this!" snarled Bock, one of the two collision victims. "Yeah, we'll get you Hardys through a series of empty threats and petty vandalism," sneered Simon, as he piloted the other boat to safer waters. "I don't like their looks," drawled Chet, an opinion which would be shared by most everyone the Hardys would speak to in the foreseeable future. "Chet, since when do you have a drawl?" 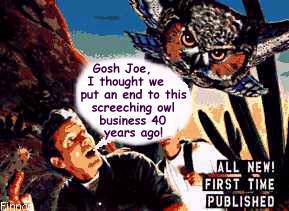 interjected Joe. "I do seem to be drawling a lot lately," drawled Chet. "I wonder how those fellows knew our names," mused Frank. "I have a hunch that will never be explained," predicted Joe. Eventually, Frank, Joe and Chet got around to rescuing Mr. Perry, who, fortunately, had not been wearing his thirty-two pound diving shoes at the time. As it turned out, Mr. Perry had originally been on his way to keep an appointment with Frank and Joe's father, Fenton Hardy, the world-famous detective. This could hardly be considered a coincidence, since no one ever came to Bayport except small-time smugglers and clients of Mr. Hardy. "That's very kind of you," expressed Mr. Perry. "A T-shirt and an old pair of sweat pants will be more than enough." But Mrs. Hardy, who had a "thing" for tall, well-dressed men, insisted that the near-total stranger wear her husband's favorite tweed suit (along with his new Van Husen button shirt, his favorite necktie, and a pair of cufflinks that had been given to Mr. Hardy by his late grandmother). After force-feeding Mr. Perry a huge dinner, capped off by multiple apple pies, it had become obvious that Mr. Hardy was displaying his usual lack of punctuality. "I'll try to contact Mr. Hardy some other time," lamented Mr. Perry. "I guess there would be no reason for me to leave my phone number, or address, or any way at all for him to contact me. But dinner was lovely. And thanks for the swell suit!" And with that, the now-well-dressed diver took his leave. "Welcome home, Dad! Gee, it's great to see you," gushed Frank and Joe to their father. Mr. Hardy's famous exploits had once caused him to neglect his sons for weeks at a time. Now that Frank and Joe had demonstrated considerable talent as amateur detectives, Mr. Hardy often let his sons assist him on important cases, putting them directly in harm's way. "Nice to see you again, boys," chimed Mr. Hardy, giving the boys a noncommittal hug. "Sorry I stood up yet another potential client but I suppose there's always more where he came from!" "What kind of case are you working on, Dad?" inquired Joe excitedly. "Darned if I know," chuckled Mr. Hardy. "My memory is so bad that if didn't take notes constantly, I'd be completely up the creek. That's why I keep those notes in a safe place." "You mean in your wall safe," guessed Frank. "Or your file cabinet or desk drawer," speculated Joe. "No, no, all wrong," answered the famous sleuth, grinning confidently. "Someplace much safer: in the pocket of my favorite tweed suit!" Fenton Hardy paced the room like a caged lion. Time was running out. If the boys didn't recover his notes, he would be in a terrible jam. If only he could remember some of the pertinent details of the case, such as who the client was, or what he was supposed to be investigating. No, it was just no good. Too many whacks on the head from too many criminals. He would have to wait to hear from Frank. And the other one, the blond fellow. The famous detective was ruminating on how the blond boy didn't really look very much like him when the phone rang. He snatched it up anxiously. "Hello? Dad?" came the voice on the other end. It was Frank. Mr. Hardy breathed a sigh of relief. The boys had come through for him! Frank Hardy spoke into the receiver of the pay phone. "Yes, Dad, we managed to track down Mr. Perry, and your tweed suit as well." "That's wonderful news, Frank. Any complications along the way?" "Uhhh, well," began Frank, "an old man in a restaurant accused us of stealing his cane, and had the police arrest us." "What!" ejaculated Mr. Hardy. "That's ridiculous! Why would you steal his cane?" "Oh, it turned out well enough. We dropped your name, as we always do, and they let us go." "I suppose that's all right, then. No other problems?" "Well, at one point we came across an elderly woman who had apparently fainted; we took her to the doctor," continued Frank. "Was she with the old man who lost his cane?" queried Mr. Hardy. "No, this was pretty much unrelated. It turned out the doctor was her husband, and he then accused us of having murdered her." "Murder! Frank, what in the world are you talking about," gasped Mr. Hardy, who was rapidly becoming exasperated. "He attacked us with a bullwhip. But then the old woman's parrot returned, and she was fine again." "The parrot was named Ferdinand, incidentally..."
Mr. Hardy was nearing apoplexy. "Frank, what does any of this nonsense have to do with my notes? You did recover them, didn't you!" "Well, we thought we had them after the fire, but--"
"At the tailor shop, where your suit was. Joe and I broke into the shop when a fire started." Mr. Hardy's hand covered his eyes as he spoke into the receiver. "You broke into a tailor shop and started a fire? Good God, why??" "I'm pretty sure the fire started first. Anyway, Joe pulled your suit from the burning shop, but it turned out he only got the pants." "Not the jacket that contained the notes?" croaked the detective, his voice all but inaudible. "Somehow or another, Bock and Simon ended up with the jacket and--"
"The two fellows whose boat we rammed the other day," explained Frank. "Oh my God," whimpered Mr. Hardy. "My insurance..."
"Oh, and we've also been helping Mr. Perry with his deep-sea diving. It's really exciting, Dad! You wear this big helmet and--"
"I... really... don't want to hear. Tell me... about the notes...."
"And someone keeps breaking into our hotel room and leaving threatening notes. It's happened four or five times now, but they've gotten away every time. The most recent time they made off with an experimental underwater X-ray camera that had been entrusted to us. I mean, we did leave it unattended, but who figured they'd break in yet again?" "Anyway, we finally managed to get the notes back from Bock, Simon, and their boss, whose name I don't think I can say over the phone, so we'll be sending them to you right away, Dad," Frank announced triumphantly. He heard no reply on the other end other than a low sobbing. Then came a sharp click and the droning of the dial tone. "Was Dad proud of us?" Joe asked his brother. "I'm not sure. I guess we were cut off," theorized Frank, replacing the pay phone's receiver in its cradle. "Enough of this detective stuff," drawled Chet one last time. "When do we eat?" Many of the other titles are mundane but some are tantalizing. What could we have expected of 1930's The Disappearance Of Fenton Hardy - another House On The Cliff perhaps? Of course, steady readers know that a disappearing Fenton Hardy is not exactly unusual in the series. From the original 1927 House On The Cliff to Spiral Bridge in 1966, Fenton had the knack of disappearing at the drop of a hat! In fact, one would be hard-pressed to name a book in which Fenton isn't missing at least part of the time. 1932's The Mystery Of The Bayport Lights sounds intriguing, especially with all the current reports of mysterious lights over the NJ Turnpike and other places! In fact, all the 1932 title proposals are rather unusual. 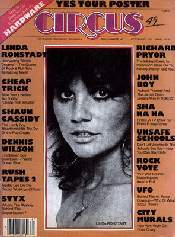 Several titles were proposed in multiple years. Additionally, some titles had hand written corrections/suggestions added to them or words crossed out. All such permuations are listed separately. Note: This list of titles was noted "Please OK 5 titles"
NOTE: This went on to become "Hunting For Hidden Gold"
NOTE: These three evolved into "The Secret of The Caves"
NOTE: Another tentative title for this story was "The Stolen Rosewood Treasure Box"
I lost a great deal of sleep last night perusing your website! Thanks for providing such thorough and entertaining information on the books that were a treasured part of my youth. My wife and I recently moved and my interest in the Hardy Boys was rekindled when we came upon a box of the old books that had been tucked away in the attic for many years. My brother started the collection in the 1950s and I picked it up in the '60s; it is the complete series up to "Mystery of the Whale Tattoo," which was issued about the time I lost interest in the books (probably from my disgust with "The Secret Agent on Flight 101" - even as a kid I could tell that was a stinker!). All editions are whatever was on the market from about 1955 through 1968, including several yellow-spine editions and all original editions from those years. - John Larrabee - Associate Editor, Fine and Popular Arts; Encyclopædia Britannica, Inc. I looked up the Hardy Boys on a search engine and came up with your site. Good idea. I received my dad's copies of his H.B. books when I was a kid and just recently started looking through them again. I stopped collecting after #53 when the stories weren't as good anymore. I have just finished browsing your absorbing site dedicated to the Hardy Boys. I have been a fan of the Hardy Boys for more than a quarter of a century, having been given my first Hardy Boys book (The Secret of Pirates' Hill) by a family friend for my eighth birthday. Although too young to understand it properly at the time, I read it with relish a couple of years later - and proceeded to read every book in the series that I could get my hands on. It is to the Hardy Boys that I attribute my life-long love of reading. It was also from this series that I learned to write : I memorized one of the books almost word-perfect in my early teens - which taught me all about writing style. Now, as an English-language tutor, I use these mysteries as textbooks for teaching immigrants the idiom of the English language (as well as giving them something to read that they won't want to put down!). If the time comes when I am less busy and I get to make a website dedicated to the Hardy Boys, I will link your site to it. It's one of the best I've seen! - David Cannon. Plus Nancy Drew, Tom Swift, Chip Hilton + other books, videos, DVDs & MORE! Not to mention THE THREE STOOGES & THE BOWERY BOYS!! !